Welcome to my hat shop! These soft cuddly koalas, lambs, pandas, chickies, and not-so-scary lions will look adorable on any little girl or boy. They are my original designs and you should not find them any place else. I also make classic flower hats because they are so heartbreakingly cute on little girls. They look pretty good on us grandmothers too. My sister-in-law wears the mauve one with the pink flower. I hand-knit all my hats with 100% acrylic yarn. They can be hand-washed in cold water. As a veteran Mom with five grandchildren under 5, I know how important that is! We had a crisis when Kayla's cupcake hat went missing. We finally found it on the floor of the restaurant where her cousin had spilt chocolate milk. The icky mess came clean after a bath in the sink with detergent. Anna loves her Snowman the most because she can squeeze his little "carrot" nose, while Zoie prefers to buzz about in her bumblebee. Julia has no preference. She likes to chew them all. I wear a penguin because I think the world would be a better place with peace, love, and a lot more silly hats! Scroll down to see my collection of hats. 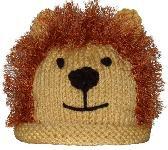 Leo the Lion's ears poke through a halo of mane that surrounds his golden-brown face with its black features. This little bird with an orange beak and feet will keep your little one warm on a chilly day. 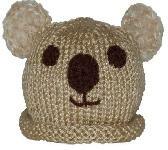 Cute Koala will steal your heart with his fuzzy ears and dark brown facial features on a soft tan head. 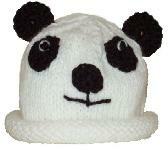 Shy Panda has just enough white around the black French knot eyes to define them. Mary's lamb is made of cream-color Homespun yarn to give her a natural "wooly" look. She's my favorite. You can special order a twin brother with light blue inside his ears. Girls like blue hats too, especially when a crocheted butterfly flutters around. I like the bright yellow wings on the black body, but I can make the wings any color that you want. This black and white puppy with fuzzy ears and a little red tongue begs to be your child's best friend. This bright yellow chicken with a pointed orange beak and tuft of "feathers" on top looks more cheeky than afraid of the sky falling. 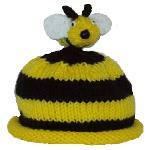 A big bumblebee sits on this yellow & black striped hat. It's hard not to laugh. Kudos to Grace Alexander who created this fabulous design for Coats & Clark. A mottled green Arizona sidewinder slithers across this sandy tan hat. Back off! 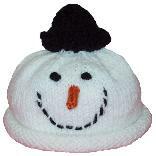 Mr. Snowman has a big grin, an orange "carrot" nose, black "coal" eyes, & a small black derby on his snow-white head. Deck your little one in this Christmas green tree covered with shiny French knot "bulbs" & a bright yellow pompom topper. Here's a pink-frosted cupcake with bead "candies" and a cherry on top. I will substitute chocolate or multicolor "sprinkles" made of yarn for babies and toddlers under 3 years. My pumpkin hat has ridges like a real pumpkin, as well as a green stem, leaf, and tendrils. There are other cupcake hats with pink frosting, but no other one has a "lit red candle" for special birthdays. I made this version for my mother-in-law's 95th. It was a major hit! My sister-in-law requested this classic mauve hat with a bright pink flower and two muted green leaves. It also looks sweet with only one leaf on young girls. This pure white hat has a pink crocheted side flower with a yellow center and muted green leaf. Other flower colors can be special ordered for a white hat. Any girl would love this pink hat. It has a pure white flower with a muted yellow center and bright green leaf. Other hat colors can be special ordered. With a side cluster of pastel crocheted flowers with pale yellow centers, this multicolored hat is perfect for a newborn baby girl. This soft green hat has a cluster of rose crocheted flowers with soft yellow centers. Other flower colors can be ordered. Topped with a cluster of pastel pink crocheted flowers with pale yellow centers, this multicolored hat is perfect for a newborn baby girl. I like the top cluster of crocheted purple "violets" with muted yellow centers on this olive green hat. 409 Bright green hat with top rose. I think the crocheted rose looks great on the top of this bright green hat in place of a pompom. You can special order any color combination. White makes a good base for a top cluster of rose crocheted flowers with pale yellow centers and bright green leaves peeking out. A little green worm is peeking out of this red apple hat. It has a tan stem and green leaves. Available in the fashionable colors of pink and brown or blue and brown or any combination you want. Please specify when ordering.